It was only a couple of weeks ago that I received confirmation from Darren Rice of the female humpback whale pictured below with a 7th calf in Tonga. Darren and his son JJ captured video of this whale and her baby in the Kingdom's Ha'apai island group (see previous blog post) in August this year. 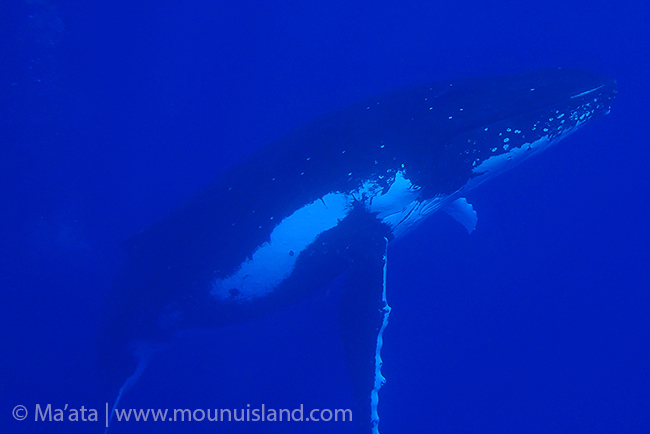 Well now, with the help of Ma'ata at Mounu Island Resort, I have documentation of super mommy + male calf in Vava'u this season as well! Ma'ata spotted mother and calf on 8 October, about a mile west of the Hunga entrance to the inner waterways of the Vava'u island group. Everyone (logically) assumes that humpback whales travel among the islands, but it's still exciting and useful to have solid photo/ video proof. This is the first time that I've been able document a mother/ calf pair in both island groups (about 130km apart), thanks to the help of Darren, JJ and Ma'ata. Here is an updated PDF file with a summary of this female humpback with all seven of her calves, from 1998 to 2014.